Brighten up your wordpress installation with the Huex theme. With it you get 5 color schemes to choose from with a custom back-end control panel, so even the level one user can get to grips controlling each feature it has to offer. 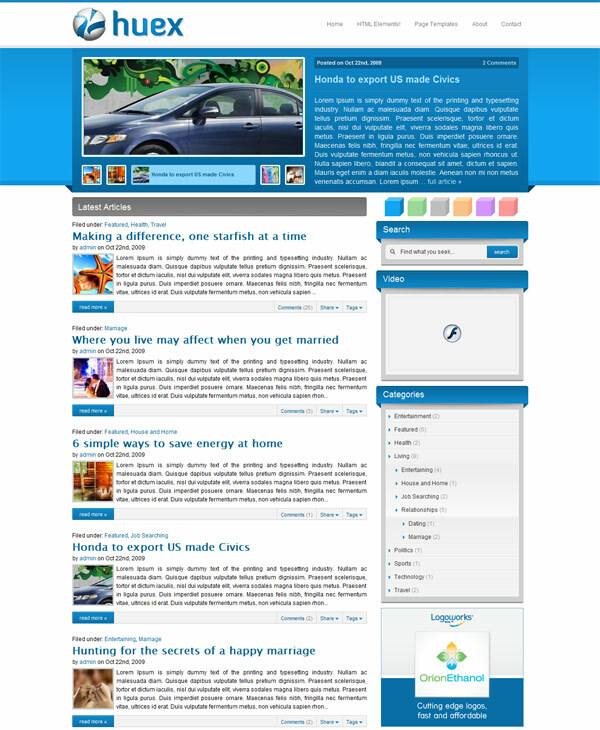 The Huex premium wordpress theme is WP 3.0 Ready, Supports 3.0’s Custom Menus, has Intuitive Theme Options Panel, offers an Unique Homepage Slideshow with 15+ Optional Effects and different Color Schemes and you can Choose One or Let Your Users Choose. The theme has a Two-Column Layout, Menu & Submenu ‘Show’/’Don’t Show’ Customization, WP Now’s Custom Tabbed Widgets, it is Widget-Ready and Adsense-Ready, offers an Easy-to-Use Pre-Defined Ad Locations, “No Sidebars” Template, “Links & Bookmark” Template, “Sitemap” Template and is Social Media Ready – Facebook, Twitter, MySpace and LinkedIn integration.